Novos Baianos (or Os Novos Bahianos prior to 1972) was a Brazilian rock and mpb group from Bahia that was formed in the 1969 and enjoyed success throughout most of the '70s. Band members were Paulinho Boca de Cantor, Pepeu Gomes, Moraes Moreira, Dadi, Luiz Galv&atilde;o, Jorginho Gomes, and Baby Consuelo, today known as Baby Do Brasil. Initially their sound was a fusion of psychedelic rock with traditional folk sounds, Brazilian as well as Latin, a style that is most evident in &Eacute; Ferro Na Boneca (1970). 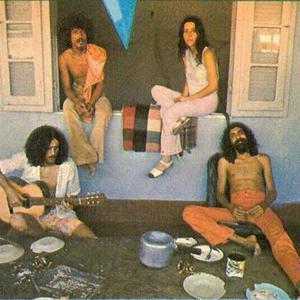 Initially their sound was a fusion of psychedelic rock with traditional folk sounds, Brazilian as well as Latin, a style that is most evident in &Eacute; Ferro Na Boneca (1970). Their music began to gravitate more towards MPB, particularly due to Jo&atilde;o Gilberto's influence, who frequently visited the group. Their 1972 album Acabou Chorare contained the classic Preta Pretinha. The group had a strong hippie image and in same year, they moved to a community in Jacarepagu?. They left Som Livre and joined the Continental label in 1973. The band released records until their break-up in 1979. The album "Acabou Chorare" was elected in 2007 as the best Brazilian music album of all time.